Traveling around China was easier than we thought. We didn’t have any issue and the Chinese were always happy to help us, even when we couldn’t understand each other. 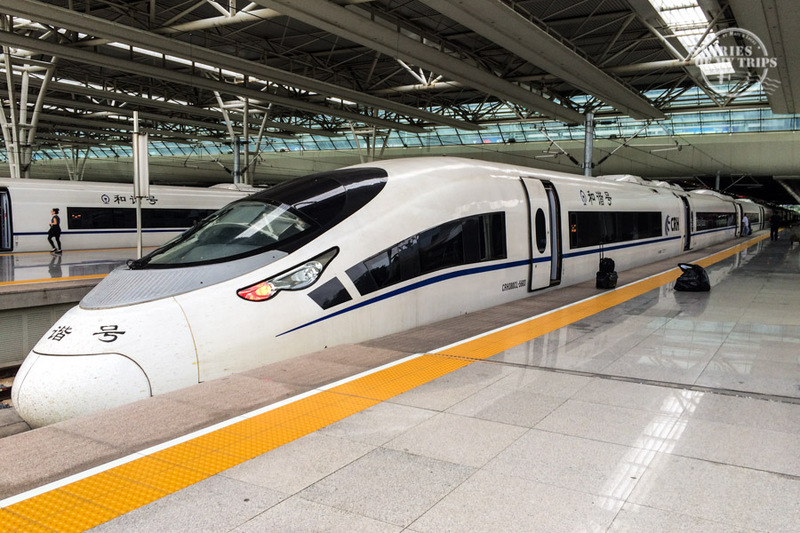 Since there are millions of people in every city in China, the transportation system is very well developed and every city is well connected. You always need your passport when you buy the tickets, and you can only buy them in the counters. There are self-service machines, but they are only for people with Chinese ID. You might get lucky and the person in the counter speaks English, but the best you can do is to have your destination written down in mandarin, along with the date and time you want to travel (check the timetable in advance), as well as how many tickets you need. Usually the staff at the hotel are happy to help with this. For the long distance trains (i.e Beijing to Shanghai) you can buy them online and for a small fee, they are delivered at your hotel. We had planned to go to China for two weeks and ended up staying for a month. It is so big and interesting! I didn’t want to leave, but the visa was over. We landed in Beijing and getting from the airport to the city was very easy. There is a train from the airport that takes you to the center and from there you can make the connections with the metro that you need. The train ticket and the metro ticket are 2 different tickets. In this post you will find more details on how to use the metro in Beijing. We stayed for a week in Beijing visiting the Hutongs, the temples, the palaces, the Great Wall and we thoroughly enjoyed everything about its culture. It is a very big city with lots to do. The easiest way to get around is by metro, we used it all the time and it took us everywhere. To go to the Great Wall we took a Sunset Tour to Jinshanling, a section of the wall where there are not tourists and that hasn’t been not restored. It was spectacular. Almost every hostel organize this type of tours, they all have different prices so it is better to ask around. You can also go to the wall by your own using public transportation, but it takes you to the most popular section of all and the least authentic. To go from Beijing to Shanghai we took a high speed train and it took us only 4 hours. But there are many options and different prices. You can get a slower train, a sleeper, etc. We asked our hotel to help us buy the tickets and they did everything for us. They even delivered the tickets at the hotel. In Shanghai we stayed far from the center, but close to a metro station, so it was very easy to go around the city. We stayed in Shanghai for 4 days and took a day trip to Suzhou and another to Hangzhuo. We reached both by train. Buying the tickets was very easy, the girl from our hotel helped us by writing in mandarin the names of the destinations and the dates of the trip for us. From Shanghai we took a plane to Zhangjiajie but we did not want to stay there as it is about an hour and half away from the park. We wanted to be in the town right next to the park (Wullingyan), so to go from Zhangjiajie airport to Wullingyan we took the local bus that took us to the bus station, and from there we took a bus to Wullingyan. We were lucky we had the name of the town written in Mandarin because we had to ask several people and several drivers until we found the correct bus. The next day we bought the park entrance which is good for 4 days (consecutive) and we spent the next 4 days visiting different sections of the park, waiting for it to clear a little to see something, because we had bad luck with the weather and the fog. Within the park there are different buses, cablecars and even an elevator to reach the different points. In our hotel they gave us a map and an excellent explanation of how to visit it. Our next stop was this beautiful city. To go from Wullingyan to Fenghuang we took a bus that took 4 hours, we bought the ticket at the Wullingyan bus station on the same day of the trip. From the Fenghuang bus station we took a local bus that took us to the old town, the most beautiful area to visit and where our hotel was. The old town of Fenghuang is small and you can visit it by walking. We stayed for two days and from there we took the bus to Guilin. From the Fenghuan bus station, there is a direct bus to Guilin that takes about 4 hours. From the Guilin bus station we took a local bus to the center where our hostel was. Guilin is very big and you need buses to get around if you want to go beyond the center. We did an excursion to the Longji rice terraces that was organized by the hotel. It is possible to do it by your own, but you have to take 4 buses, coordinate the schedules of each one and in the end you save only 50 yuan but you have less time to visit the terraces and it seems more complicated to do it this way. To go from Guilin to Yangshuo we took a local bus to the main bus station and from there a bus to Yangshuo, which leaves very frequently. The road to Yangshuo is long and not worth going just for the day, at the end you spend 5 hours on the bus in total, because the road is short but full of obstacles and constructions. If I had to do it again I would consider staying in Yangshuo. We heard by chance about Xingping and decided we wanted to stay there. To get there we took the bamboo rafts tour (which has no bamboo, just the name) from the hotel. It took us up the river to 9 Horses and from there a small bus took us to Xingping (also part of the tour). The tour goes all the way to Yangshuo, but since we wanted to stay in Xingping, we got off the bus here. Xingping is tiny and you can walk everywhere, the best thing to do here is hiking to visit all the panoramic points of the mountains, which are amazing. To go from Xingping to Hong Kong we took a bus to the Yangshuo train station which is 15 mins by bus. From there we took the train to Guanzhou, then we took another train to Shenzhen and crossed the border to Hong Kong walking. Everything is very well marked and after going through migrations, you find the subway which takes you to the center of Hong Kong. Hong Kong is huge and it is best to buy the Octopus card to use it on public transportation. We used metro, buses, trams and ferry to move around the city and the other islands during the 4 days we stayed. To go from the center of Hong Kong to the airport very early in the morning, we were able to take a bus at dawn (3am), it costs HKD 23 and it takes one hour at that time. There are several night buses that go to the airport departing from various places in the city. This is how we ended our one-month trip in China. The truth is that 1 month is very short, I wanted to see and do much more, so now we really want to go back. In the next posts we will be telling you how it went in each city and how we fell in love with this country. If you have questions about traveling around China, leave them in the comments and I’ll answer them.